Group messaging, photo filter apps, and now … calendars? A schedule of your daily appointments might be one of the most inherently boring app categories, but judging by the number of pitches hitting my inbox, it’s also cropped up as one of the latest iOS(s aapl) app trends. More than five years after the iPhone debuted with a built-in calendaring app, third-party developers are still trying to one-up each other on who can build the best mobile calendar interface. Fantastical has set the bar for iPhone calendars; for simplicity and ease of use it’s one of the best and basic ways of adding events to your calendar — for a price ($3.99). Sunrise is the most fun and easiest on the eyes and, crucially, it’s free. Both were released in the last three months. The App Store is littered with lots of not-so-great calendar apps, but there are several other really good ones too. On Wednesday comes another entrant; this one is simply called Calendars. This effort is from one of the most popular iOS productivity app makers, Readdle. That’s the same Ukrainian development shop behind Scanner Pro, Remarks and PDF Expert. Readdle gets good exposure in the App Store and its apps are often among the top downloaded, so if you’re in the habit of scanning the iOS App Store, you’ll likely see this one when it goes live on Wednesday. Calendars is free and works on the iPhone or iPad. 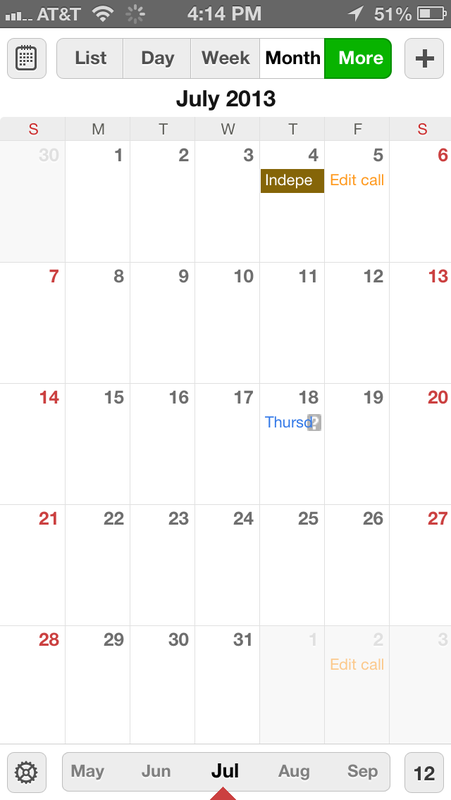 The interface isn’t anything fancy but it’s easy to understand if you’ve ever used Google Calendar. The app isn’t the best I’ve used in the category, though you can’t argue with the price. It supports either your iPhone calendar or a Google Calendar — but only one at at a time. If you want more, you can upgrade to a more feature-heavy version. Yes, Readdle actually already has a calendaring app, called Calendars by Readdle. With the introduction of the new, free app, the old paid app will henceforth be called Calendar+. It costs $6.99 and has a lot more features, such as text or email alerts for appointments and the ability to invite attendees to meetings. That app already has 500,000 users, according to the company. But just as the market for well-designed calendar apps is growing, Readdle is introducing a free version. As for why something as perfunctory as mobile calendaring seems so hot right now, Readdle’s Denys Zhadanov says it’s because the perfect formula hasn’t been found yet and developers are striving to make the interface as easy as possible to use and “natural” for users. The idea that the iPhone calendar could be improved isn’t exactly new. Two years ago, some saw basic functionality missing: it didn’t have a week view option, which prompted the developers at Week Cal to make an app to fill in that gap. It’s now one of the most downloaded iOS calendaring apps. Based on the recent calendar apps efforts we’ve seen, the improvements left to make today are more granular: improving ways to add events, creating the least overwhelming way to view multiple calendars, or combining appointments with other needs like task management, location information or social networking. It’s not the sexiest app development work out there, but it’s the kind of improvement that make the iPhone a real tool for work and not just an entertainment device.